Cool shop, lots of selection. I am fan of the yellow walls, really lets you see the guns. What do you think ? 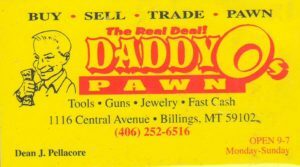 This entry was posted in Gun Shop, Montana and tagged Pawn Shop by gwebs. Bookmark the permalink.